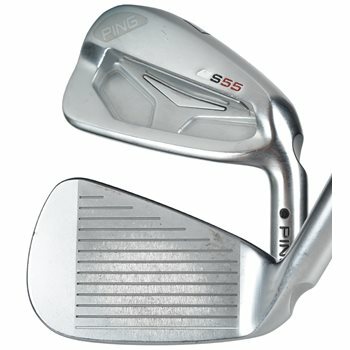 The Ping S55 iron features a 17-4 stainless steel head with precision machined face, grooves and cavity to ensure quality and produce consistent performance throughout the set. Its larger Custom Tuning Port (CTP) is deeper in the head creating a lower center of gravity for higher launch angles and helps produce an improved feel through impact. A vertical bar on the back of the club stabilizes the face to provide exceptional distance control from shot to shot, while the tungsten weighting in the toe stabilizes the head on off-center shots for improved forgiveness. Review by VC, 2 years ago. Do you know what shafts are in this set...? Please refer to the actual listing for more details on the shaft that is on the set. It could vary depending on availability. The set in question is the 6-P, the description says no label. It appears this set must have sold as it is no longer on the website. When a set is listed as being, no label, it means the previous customer took the label off. Our PGA Professionals has determined the type of shaft that is installed. What's the lowest you can go on the new set of s55? All prices listed for new clubs are the lowest we can go.